President Chris & Hazel paid a visit to the Rotary Club of Beverly Hills. 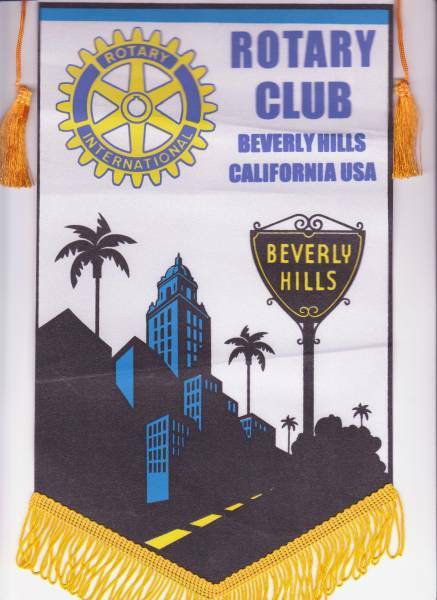 President Chris & Hazel visited the Rotary Club of Beverly Hills which meets at the "star's hotel" - The Beverly Hills Hotel on Sunset Boulevard - yikes! how posh is that? There's a good chance you might bump into someone famous in the lobby but, on this particular day, the stars were all taking lunch elsewhere! A warm welcome was received from President "AJ" Willmer and the 95 members present. There were other Brits on our table: A visitor from the Rotary Club of Truro and a brand-new member of the Beverly Hills Club, Freddie Windsor (married to the actress Sophie Winkleman and son of the Duke & Duchess of Kent) I said it was posh! As you might expect at such a prestigious venue, the lunch and the service were outstanding (if a little expensive at $35 each) but this high standard was replicated by the flow of the meeting. First the Youth Opportunities Officer introduced a 17 year old High School student and spoke about an amazing programme which the Rotary Club is sponsoring to reduce the number of fatalities caused by drink-driving, drugged-driving and text-message driving. A team goes into local High Schools and does a drama workshop in which a fatal road accident has occurred. The "fatalities" are hidden away and the rest of the students are led to feel what it is like to learn that their friends have died. Then there's more to come; The "Fatalities" write letters from "beyond the grave" to their mothers and friends explaining how sorry they are that they were stupid enough to ride in a car when the driver was drunk, drugged or sending text messages when the accident happened. By the time our 17 year old visitor had read out her "Letter to Mum" nearly everyone in the room was in tears. Hard-hitting or what?! The programme is having a really positive effect and the number of youth fatalities is dropping rapidly. The second speaker was Robert Gupta, a violinist with the Los Angeles Philharmonic Orchestra. After playing a Bach violin sonata beautifully he introduced the charity he has founded - Street Symphony - http://www.streetsymphony.org - which brings music therapy to the mentally ill living on "Skid Row" in Los Angeles (80,000 people!!!). Groups from the orchestra go down to Skid Row and play to the homeless; Apparently the positive effect on their well-being and happiness is extraordinary. They are about to extend their activities to offer music therapy to Dementia sufferers - an exact parallel with the work of "Sing For Your Life", one of our nominated charities. Robert Gupta then played some more Bach to wind up his talk. What a treat! The final impression of the meeting? The $8 Valet Parking!! As 95 Rotarians and a further 200 lady delegates from another meeting in the hotel all left at almost the same moment, we only had to wait 90 seconds for our car to be brought to the front entrance of the hotel! Now that's Beverly Hills service!